Last friday I was in Paris for the week-end. A bit of business and a lot of pleasure. What a better way to start a Friday night than with a dinner at one of my favourite bistrots in Paris, l’ami Jean. I can’t tell you how much I love this place. 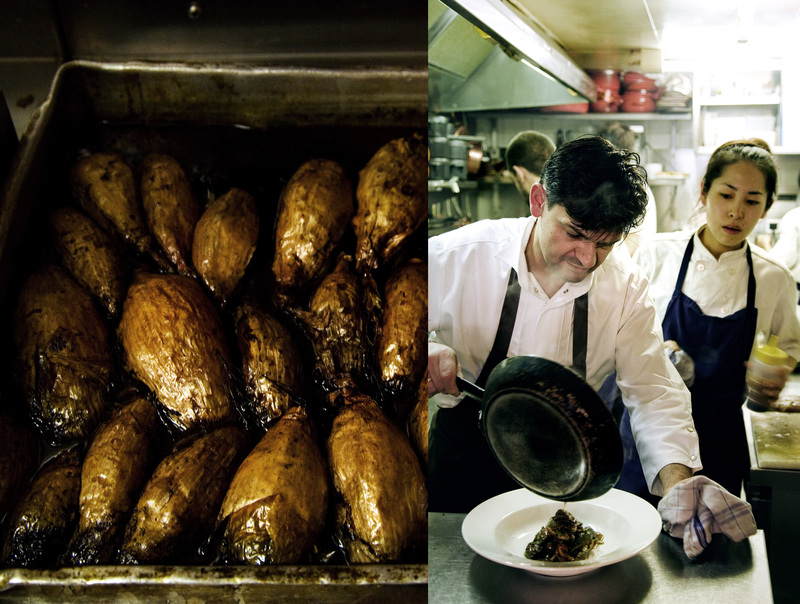 Not only is the chef Stéphane Jégo a friend, but he is also a genius in the kitchen. His cuisine matches my taste. He cooks in the true bistrot way, which is, in my opinion, gastronomy without the ‘chichi‘. 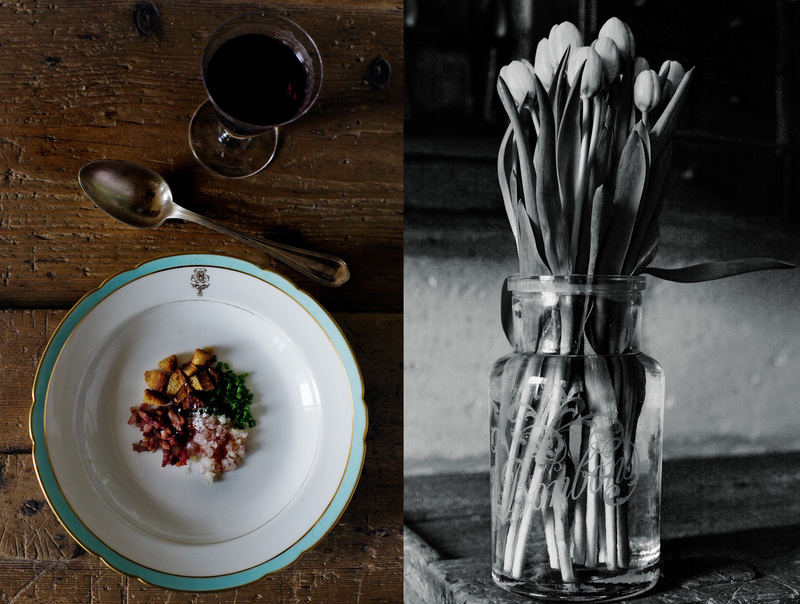 At l’ami Jean, you dine on wooden rustic tables, the room feels like a tavern, you can see, feel and hear the chef. The heat and wine flatter my cheeks, and yes, I feel full and happy when the meal is finished. That’s how I like to eat, enjoying the food, the quality, the atmosphere and the talent. You can just go there for a drink and a charcuterie plate, or have a culinary feast. 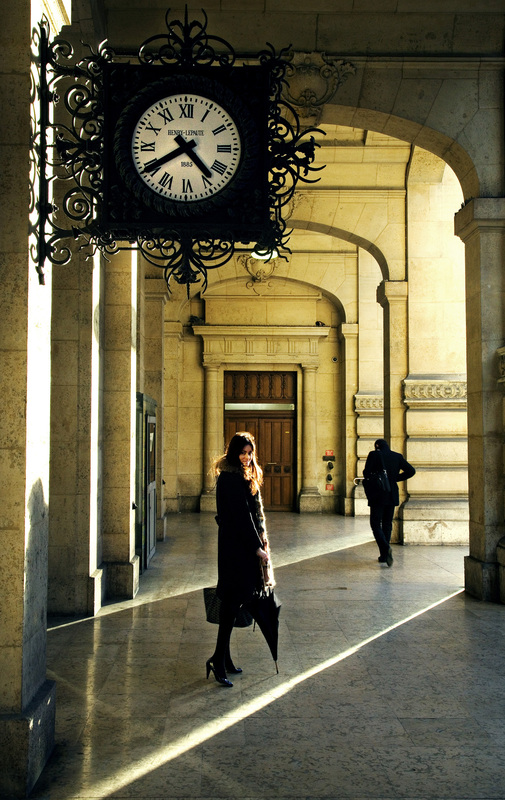 When I lived in Paris, I was a regular at l’ami Jean, a few steps away from the Eiffel tower. Not only was it a street away from my apartment, but I also met Stéphane on a daily basis outside our kid’s school as his daughter was in the same class as mine. While waiting for our kids, Stéphane would talk about his latest dishes, making me hungry as a wolf by 11:45 am. At l’ami Jean, you instantly feel the strength in the kitchen. The high-powered energy, fuelled by the rugged Breton Stéphane, makes this place a tour de force. There’s nothing more comforting than finding out that the soup you had once upon a ‘memory‘ is still on the menu. 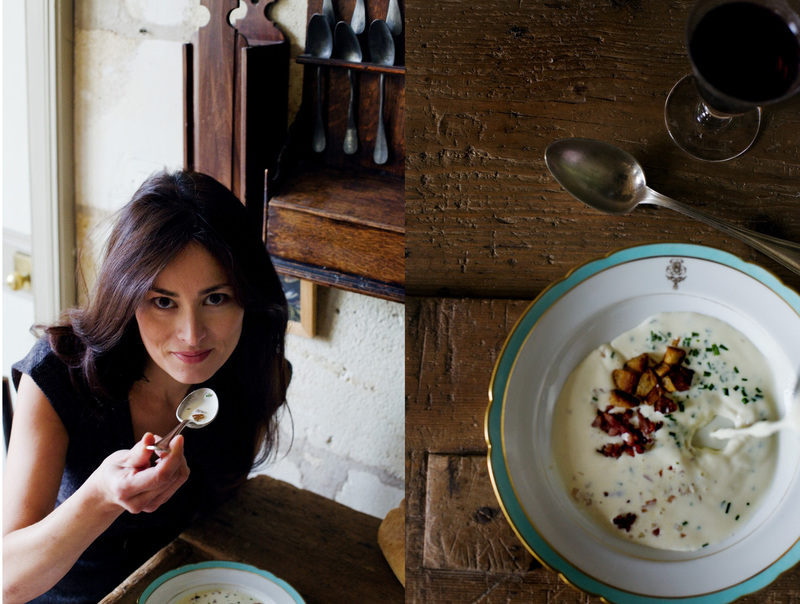 I am talking about the famous Parmesan soup, a must-have at l’ami Jean. 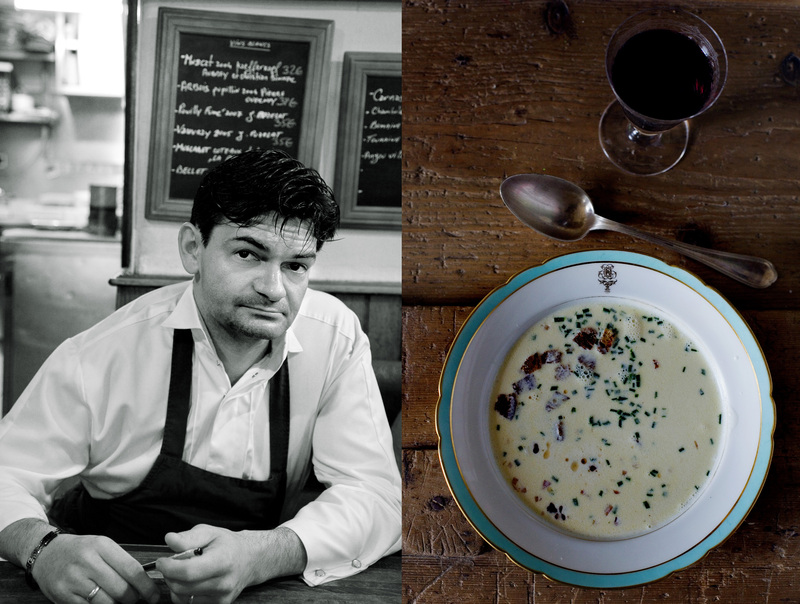 I just had to order it once again, this very rich and decadent soup filled with bits of deliciousness – shallots, chives, croûtons and bacon sitting impatiently at the bottom of a soup dish, ready to be immersed in a velvety and creamy Parmesan ‘émulsion’, as Stéphane calls it. What can you say when a soup hits all the right notes? C’est si bon! Stéphane was kind enough to share this recipe. 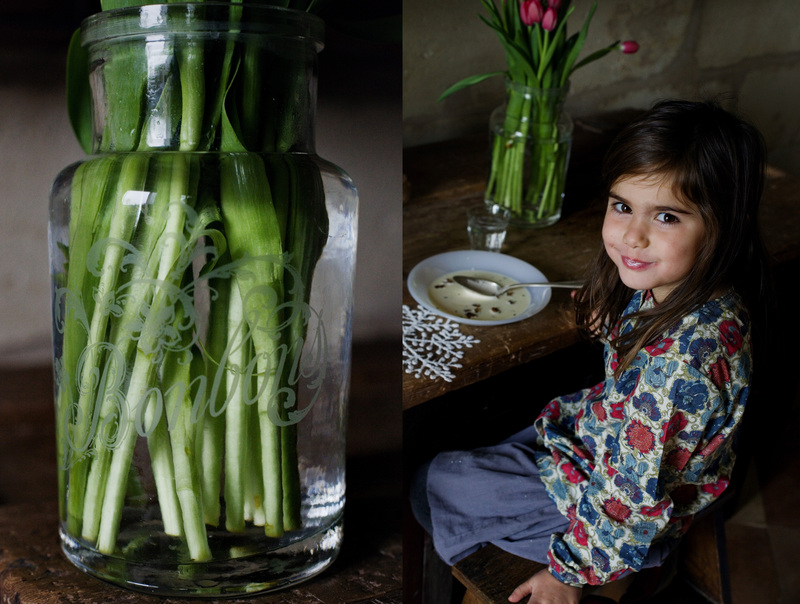 As soon as we were back home in Médoc, I found myself making the soup for lunch. The kids loved it so much at the restaurant, and wanted to know if I could re-create it at home. It was so good, so delicious, I think I’ll be making it again for Christmas. Merci Stéphane! I feel like I have Paris on a plate again. L’ami Jean, 27 rue Malar, 75007, Paris France. Coarsely chop the onions. Melt the butter in a large pot, add the onions and fry on a low heat for 10 minutes. Add 150 g of sliced parmesan, chicken stock, milk and cream. Simmer on a low heat for 45 minutes. Meanwhile, chop finely the bacon. Fry for 5 minutes until crispy. Seta side. Finely chop the chives, shallots (as fine as possible). Set aside. When the soup is ready, add the remaining sliced parmesan. Simmer for a further 10 minutes. Mix in a food processor, and strain through a sieve. Season with salt and pepper. Keep the soup warm. 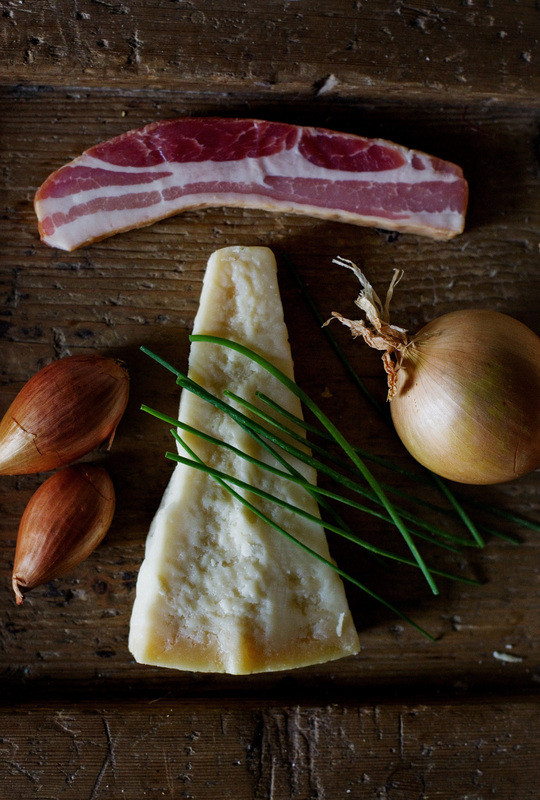 Place the shallots, chives, croûtons and bacon in a soup dish, serve soup immediately.